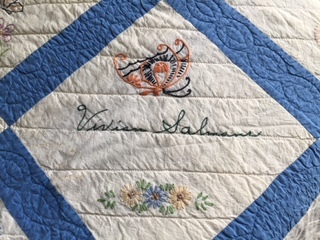 It wasn’t the most stunning or fancy quilt I had ever seen, but it had the sweetest story surrounding it like the arms of a loving grandmother. I seem to remember this handmade quilt on one of the spare beds at Grandma’s house. It was only used when my sister, cousins and I came to visit. I’m not even sure at what point I asked her about the story of the quilt, but Grandma Vera Chenoweth shared it. 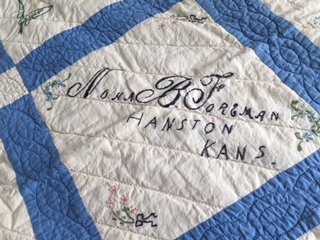 The handmade “signature” block quilt had embroidered on each block the name or signature of a different family member in Kansas. In my last post – titled Wedding – you’ll recall I told the story about my Grandma Lena Belle Salmans France Westlake and how she suddenly moved, with her family, back to Illinois after her mother-in-law’s death. This was Grandma Belle’s quilt. Grandma Vera told me she remembers her mother putting the quilt together when she was a child. Grandma Vera married in 1921 so this memory had to be from an early time. Grandma Vera was always very practiced in “hand” skills. He should crotchet, tat and sew with the best. She was no slouch when it came to sewing. She had asked her mother if she could help piece the blocks of the quilt together and help hand-sew the quilting stitches. She said her mother smiled and said, “No, thank you. This is how I visit with my sisters and family.” It seemed when she picked up each block, she thought of her sisters and nieces in Kansas. It had to be difficult to be so far away from her very close family. The remaining siblings all lived near each other in Kansas. Grandma Lena Belle was the only child to move away. Her quilt was much like a “prayer quilt” to her. Each time she touched the blocks, she thought of or prayed for the family member. The quilt has survived what has to be approaching 100 years. It still seems very mystical to me. I love to look closely at each block and divine the true personality of the owner. Some were much more fancy than others; some were simple and plain in light colors. Others probably have hidden meanings long ago lost much like symbols on tombstones. When I touch it, I see the loving hands of a great grandmother I never met, but know a lot about. 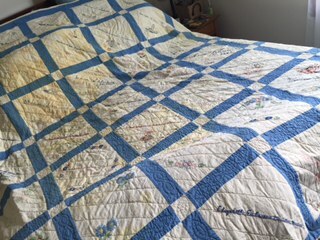 The stories I have been told about her keep her very much alive and this quilt rests on her lap while she carefully stitches each block together with sad, longing eyes and nimble fingers.